The Samsung S5PV210 is an ARM Cortex A8 base SOC. The Tiny210 and Smart210 have 1GByte of RAM and 1GHz clock. 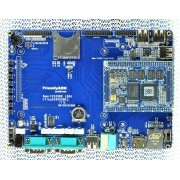 These core boards, like the Mini210SBE, easily run embedded Linux and Android from on board FLASH and run Debian Wheezy (with Python and graphics for example) on our LCDs up to 10.1 inch, or HDMI displays. The Core modules fit our SDK boards (same size as the 7 inch displays) or a board of your own design. 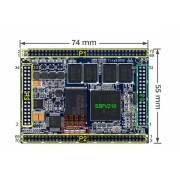 Very popular boards with great performance in a small package with loads of I/O! Tiny210SDKTiny210-1305 Samsung S5PV210 based Cortex A8 Core Board, running at 1 GHz,combined with a&..
Tiny210SDK-CAP7 - OEM QUANTITY SPECIAL ORDER ONLY......Tiny210 SDK Set (512M Flash) + 7" Capaci..
LIMITED EDITION Tiny210 Core Module with SDK Carrier Board. ARM A8 Cortex Tiny210 with SD..
LIMITED EDITION Tiny210SDK-V1.1 Tiny210SDK V1.1 120920 Carrier Board with a Samsung S5PV210 Co..
Smart210 Core Module Smart210 1GHz Cortex A8 Core Module with DM9000 Ethernet + Audio CODEC..